With the boys’ final school day for 2018 fast approaching, I am looking forward to a number of special events – in particular, Secondary School Speech Night tonight and Junior School Speech Night tomorrow. As previously mentioned in my eNews, I am also excited about our Community Carols Service next Monday evening at St Andrew’s (all welcome!). And who is not charmed by the ELC and Lower Primary Christmas Pageants? As we approach year’s end, opportunities to help others continue. As you know, we have a strong relationship with the Indigenous community of Pormpuraaw and we are always open to ways in which our communities can connect and help each other. If your son will not be needing his laptop after the end of this year, our ICT team would love to receive it. They will wipe the drive, patch the laptop if required and send it to Pormpuraaw in 2019. To arrange donation of a laptop, please contact our Director of ICT, Sandra Maher. We are still seeking one more family to host a MITS student from early 2019. If you have ever considered this opportunity, don’t hesitate to email me to discuss it further. Please be in touch by Monday 3 December. It was disappointing for all involved that, as a result of the inclement weather and the risk of high winds, we had to cancel last Friday’s Family Fun Night. I appreciate the significant time and effort spent by Nick Bulfin, Brigitte McGregor and the JPG Committee in organising the evening. As per our communication last Friday, the rides, food vendors etc. will be part of our Family Welcome Picnic on Friday 1 March 2019. Next Wednesday 5 December, all Prep to Year 6 boys will participate in a Mini Fête to raise funds for the Baraka School. This event is being run and organised by the boys, with various stalls/activities for them to enjoy. Boys are asked to donate $2 to wear casual clothes for the day. For the stalls and activities, I suggest that boys bring small change (not notes); 20c, 50c, $1 and $2 activities will provide them with plenty of fun. The Year 6 boys thoroughly enjoyed their formal farewell lunch on Wednesday. 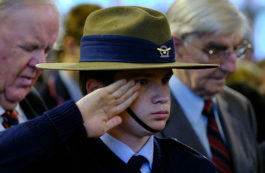 A number of speeches were made in appreciation of classmates, staff and parents. Thank you to Brigitte McGregor for her coordination, to the many mums who assisted, and to Luke Fensling, Hamish Leahy, Cathy Box and Monica Le Couteur for their support – our boys certainly did BGS proud. All Years 3 to 6 boys are expected to attend Speech Night tomorrow in the Robert Sanderson Centenary Hall. Boys will be sitting together in the seats allocated to them downstairs. They need to arrive by 7.00pm in the Atrium, which is situated adjacent to the hall, and are to wear summer uniform with their pin-striped shirt, shorts and blazer. Speech Night will commence at 7.30pm; parents are to be seated by 7.20pm. The JPG has organised a Christmas tree in the main Reception area so that families can leave a gift for children in need. These gifts will be donated to Mary MacKillop Family Services, who have asked that gifts not be wrapped. Semester 2 Reports will be available to parents on Friday 30 November via the Synportal. Best wishes to all our ELC3 to Year 2 boys and staff for the Christmas Pageants next week. I appreciate the excellent leadership provided by Claire Clarke and Amelia Barrow (ELC), and Hayley Blakiston, Jessica Taylor and Samara Madden (Lower Primary). This is also a very busy time of year for our musicians, and I wish them well for their performances at Speech Night and Carols next week. Thank you to Jared Furtado and Hayley Blakiston for their excellent leadership ‘of all that is Music’ in the Junior School. Our Community Carols Service is next Monday 3 December at 7.30pm at St Andrew’s Church. I would encourage families and boys to attend; it is a superb night and a highlight of our preparation for Christmas. You will enjoy the quality of our talented musicians and the congregation certainly has the opportunity to join in the Christmas spirit. Classes conclude for all Prep–Year 6 next Thursday 6 December at 12.00pm. The car park will be supervised until 12.30pm; boys not collected will be sent to After-School Care. Congratulations to Jody Cripps, who represented Victoria in the National Primary School Athletics Championships in the 100m, 200m and 4x100m relay last week. Our Year 6 Basketball team achieved an excellent result, coming fourth in the State Hooptime competition this week. Congratulations to Lenny Hofmann, Zach Travers, Xander Mitchell, Seb Khan, Luca Robinson, Josh Watters, Jem Spicer, Joe Ramsden and Harry Newett, and to Hamish Leahy, who managed the team. The boys chosen to debate against Turner House, Firbank are talented public speakers and were well prepared for their assigned roles. Angus Roberts, Harry George and Andrew McGregor argued the negative on the subject ‘That all schools should be co-educational’. Andrew used humour well and won Best Speaker. William Yang, Harry Pollock and Tom Jorgensen argued the affirmative on the subject ‘That Science has a greater impact on society than The Arts’. The adjudicators commended them on the depth of their arguments. Harry was awarded Best Speaker for his intonation and delivery. All the Year 6 students have developed their oral language skills, writing skills in the persuasive genre and self-confidence in the Debating program this year – thank you to Jane Lowe for all her work. Boys are welcome to play chess in the classrooms, at lunchtime Chess Cub or at after-school lessons. They understand the benefits of playing the game in developing their problem-solving skills, resilience, critical thinking and concentration. The ELC has been a hub of excitement and activity this week, with the finishing touches being put on everything. The boys have been productive with their special Christmas gift-making, and after wrapping, we’ll be sending these home to go under your tree. Our Christmas Pageant rehearsals this week have been uplifted with our School Pianist, Andrew Kerr, accompanying the boys’ singing. We have also started to practise with lights and microphones – testing out the volume of the speakers is always an exciting experience! We have delayed sending home costumes as we have wanted to photograph the boys in them prior to the performance. Please remember that our ELC3 part-time boys are required to attend on the day of Wednesday 5 December for the Christmas Pageant (which begins at 10am). We’d be grateful if you could put your name next to at least one item of food or drink to share with ELC families after the Pageant. (There is a sign-up list in the ELC.) We look forward to celebrating with all of our guests back in the ELC. Soon, we will start sending home the boys’ smocks, library bags, sneakers and gumboots. We also look forward to handing over each boy’s individual portfolio by the end of this week. Please take the time to enjoy these over the Christmas break. We look forward to a wonderful last few days with the boys and our families. It is amazing to think that the school year is wrapping up and Christmas is just around the corner. This year, the Year 5 boys have had the opportunity to be part of a Music and Art Program run in conjunction with the Australian Chamber Orchestra. Each term, the boys have Skyped with ACO musician, Peter Clark. They have had to respond to a wide variety of music and art works. In Term 2, rather than our usual Skype session, Peter surprised the boys with a visit to BGS. He brought Jessica Oddie, another ACO musician, to perform for the boys. Since then, the boys have explored graphic notation through composition and built their listening analysis skills. In Term 4, Peter set the boys the task of creating a graphic score connected with a creative story that they had to compose. 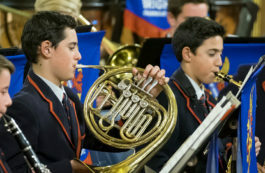 Last Tuesday, Peter and Jessica returned to BGS to hear and workshop the boys’ compositions. The boys were in awe of both musicians’ incredible skills as they explored their ideas. In thanking Peter, the boys spoke of the strong connection they had developed with him, and of the insight he had given them into the life of a professional musician. They also spoke of their gratitude for the chance to be part of such an amazing musical experience. As the drills whirred, the hammers banged and the saws churned through wood in the Design and Technology room, it was clear that it was that time of the year in the Year 6 calendar: the Billy Cart Cup! The Year 6 classes have worked in small groups to design, source materials and build their own billy carts. The teamwork has been impressive, as has the boys’ ability to problem-solve when plans don’t go as expected. With the assistance of Bill Gibney and Laura Hall, the billy carts slowly took shape as the date of the Cup grew closer. The first test runs on the new course demonstrated the driving skills of the boys (or lack thereof), as corners were missed and cones squashed and Red Square echoed with shouts of “Go left”, “Slow down” or “Faster, faster!” All of the boys in the Junior School are eagerly awaiting the big day on Monday 3 December, when the Year Level Champions will be crowned and the Best Design Award presented. Over the last decade, mindfulness has been slowly rising in popularity, with many individuals practising it on a regular basis. Evidence-based research has found that there are many benefits to mindfulness (e.g. improved memory, engagement and performance), which has prompted schools (like ours) to implement this practice into our daily routine. In this edition of SchoolTV, parents can learn the best way to introduce mindfulness to their children and implement it in their daily lives to have an overall positive impact on family relationships. Click here to view. The JPG is excited to offer custom-made House colour drink bottles for purchase by clicking here. They are stainless steel, 750ml capacity with a leak-proof lid and a carry-handle design. Come and check us out at the Open Afternoon tomorrow (Friday 30 November, 3–5pm). Basketballer, tennis player, Paralympian, BGS Old Boy and Hall of Famer Dylan Alcott will be signing copies of his autobiography, Able, at Thesaurus Books (29 Church St, Brighton) on Friday 7 December at 4pm.